Diablo 3 on Switch is just that – Diablo 3 on Switch, and that’s pretty damn cool. Potentially 150+ hours of dungeon-crawling, loot-’em-up goodness at your fingertips is a difficult proposition to pass up, especially if you’re yet to delve into the Diablo universe. Like most prestige ports making their way to Switch, Blizzard has made surprisingly few concessions to squeeze everything onto the tiny cartridge. 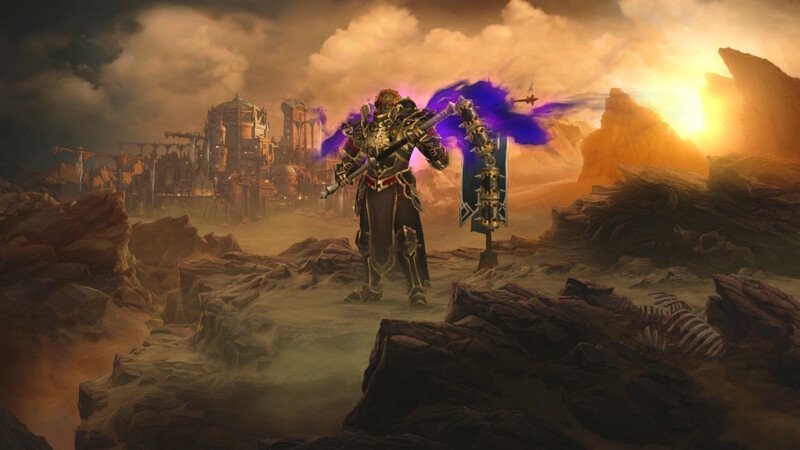 Diablo 3 might’ve first come out six years ago – and it wasn’t the most visually stunning game when it did – but the Switch makes light work of what is still a demanding game when things get hectic. In terms of performance, you’re looking at a resolution of 900p docked, and 720p in handheld mode, with a target of 60fps. That means you can expect some choppiness when the hordes really start to descend, but for the most part it’s a smooth ride – even with four players in the same game. This Nintendo version is based on the console port rather than PC, so Blizzard had already finished the lion’s share of tinkering needed to turn Diablo 3 into something that fit a controller. “We had already done so much work to get the control scheme and the visuals working, and the new menus from PC to Xbox and PlayStation, we already had a good foundation to build from,” senior producer Pete Stilwell explains. This isn’t just the base game either. The Eternal Collection includes all the expansions and updates added so far, and gives players access to ongoing themed seasons both on and offline. This means that the Switch version will be kept as up-to-date as its older brothers on PC, PS4, and Xbox, so hopefully it’ll feel more like a viable alternative than afterthought. Since they’ll start on the same season as other platforms, Nintendo players won’t have to worry about being left behind. Blizzard is working behind-the-scenes on new ideas for more themed seasons, and everyone will get to experience them at the same time when they arrive. Blizzard is also trying to appeal to double-dippers, too. On Switch you can dive straight into Adventure Mode – where the game’s story is stripped back in favour for a focus on clearing dungeons – instead of having to unlock it by advancing Diablo 3’s campaign. If you want to pick up and play, you can, rather than trying to keep up with a storyline over tons of bite-sized play sessions. “[It’s] super cool,” Cederquist explains. “Because Pete and I might’ve played this campaign before dozens of times. But now you jump straight onto the console and into Adventure mode which gives you Bounties, Nephalem Rifts and all the goodies of that. You can just jump in, start leveling and picking up some loot. “I think when we’re talking to people a lot it’s like, ‘I played it early on, I wasn’t happy with the Auction House, I wasn’t happy with the loot system’,” Stilwell continues. “Well, then you should come back. No firm release date has been set for Diablo 3 Switch, but it’s slated to come out during Fall 2018. The post “All we really did was add more” – The Eternal Collection is a true Diablo 3 experience on Switch appeared first on VG247.